Download "NAB Car Insurance. Policy Document. Product Disclosure Statement"
2 Insurance arranged by: National Australia Financial Management Ltd (referred to as National Financial Management) ABN AFSL as agent for Allianz Registered Office Miller Street North Sydney NSW 2060 A NAB Car Insurance policy does not represent a deposit with or a liability of, or is guaranteed by, either National Australia Bank Limited (ABN ) or any of its related bodies corporate, including National Financial Management. 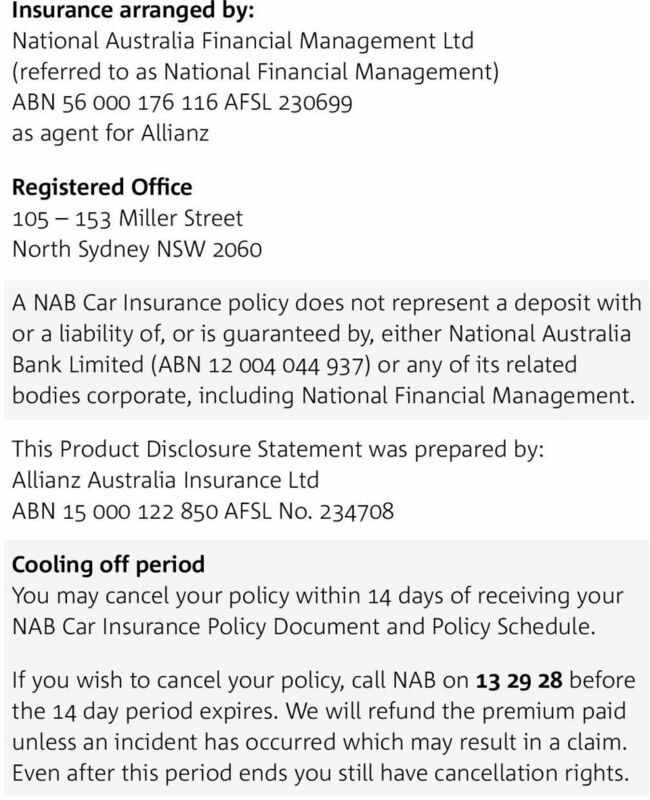 This Product Disclosure Statement was prepared by: Allianz Australia Insurance Ltd ABN AFSL No Cooling off period You may cancel your policy within 14 days of receiving your NAB Car Insurance Policy Document and Policy Schedule. If you wish to cancel your policy, call NAB on before the 14 day period expires. We will refund the premium paid unless an incident has occurred which may result in a claim. Even after this period ends you still have cancellation rights. 6 Our Product Disclosure Statement This policy document is also a Product Disclosure Statement (PDS). A PDS is a document required by the Corporations Act and contains information designed to help you decide whether to buy the policy. About the available covers You can choose one of these three covers: Comprehensive cover; Third party property damage cover only; or Third party property damage, fire and theft cover. By way of summary only (refer to policy for full terms, conditions, exclusions and limits): Comprehensive cover provides cover for: Accidental loss or damage to your vehicle up to an agreed value (ie. a set amount we agree with you) or market value (ie. the cost to replace your vehicle with a vehicle of the same make, model, age and condition as your vehicle immediately prior to the loss or damage). Your legal liability up to $20 million each event (including certain legal defence costs), for: damage to other people s property caused by a motor vehicle accident which is your fault; death or bodily injury caused by or arising out of the use of your vehicle in limited circumstances. A number of other additional benefits. Certain optional covers (where agreed) such as rental or loan car following an accident, removal of basic excess for windscreen claims, protected no claim bonus and restricted driver cover. Note that the restricted driver option provides a discounted premium, but limits the drivers who are covered under the policy. Third party property damage cover only provides cover for: Your legal liability up to $20 million each event (including certain legal defence costs), for: damage to other people s property caused by a motor vehicle accident which is your fault; death or bodily injury caused by or arising out of the use of your vehicle in limited circumstances. loss or damage to your vehicle arising from an accident caused by the driver of an uninsured vehicle, up to the maximum limit specified. 8 You will also have to pay any compulsory government charges (e.g. Stamp Duty and GST) and Fire Services Levy (where applicable) plus any additional charges we tell you of. We tell you the total amount payable when you apply and if you effect cover, the amounts due will be confirmed in your schedule. If you pay your premium by instalments refer to the Conditions of cover section for important details on your and our rights and obligations. Note that an instalment premium outstanding for 14 days may result in our refusal to pay a claim. This policy sets out the cover we are able to provide you with. You need to decide if the limits, type and level of cover are appropriate for you and will cover your potential loss. If they are not, you may be underinsured and have to bear part of any loss you are not covered for yourself. To avoid this, people seek to set the sum insured for the relevant property being insured at its estimated replacement value. You should also read the GST Notice to understand how GST is applied to a claim. If you have any queries, want further information about the policy or want to confirm a transaction, please use the contact details on the back cover. Cooling off period and cancellation rights Even after you have decided to purchase this product, you have a cooling off period and cancellation rights (see inside front cover and conditions of cover section for details). Updating the PDS Information in the PDS may change from time to time. Changes that are not materially adverse will be updated and made available to you at Alternatively, you can request a paper copy of any updated information, which will be made available to you free of charge by calling If the PDS has been updated to correct a misleading or deceptive statement or an omission, that is materially adverse from the point of view of a reasonable person deciding whether to acquire this policy, we will provide you with a new PDS or a supplementary PDS. 9 Introduction Welcome and thank you for choosing National Financial Management, a related body corporate of NAB, to arrange cover for your insurance needs. Allianz, one of Australia s largest general insurers, is the supplier of this insurance product. What the policy consists of Your policy consists of: this printed NAB Car Insurance Policy Document which sets out details of your cover and its limitations, and a schedule, approved by us, which sets out who is insured, the cover(s) selected, the period of insurance, the limits of liability, excesses and other important information. This is referred to as the current schedule in the policy document. You should carefully read and retain your insurance policy document and current schedule. These documents should be read together as they jointly form the contract of insurance between you and us. Any new or replacement schedule we may send you, detailing changes to your insurance or the period of insurance, will become the current schedule, which you should carefully read and retain. Our agreement with you We will insure you for accidental loss, damage or liability which happens within Australia arising out of the events set out in your policy during the period of insurance. This cover will be given on the basis: that you have paid or agreed to pay us the premium for the cover you have selected when you applied for cover and which the current schedule indicates is in force, of the verbal and/or written information provided by you which you gave after having been advised of your Duty of Disclosure either verbally or in writing. If you failed to comply with your Duty of Disclosure, we may be entitled to reduce our liability under the policy in respect of a claim or we may cancel your policy. If you have told us something which is fraudulent, we also have the option of avoiding your policy from the effective date stated in the current schedule. 10 For your assistance we have provided a full explanation of your Duty of Disclosure and the consequences of non-disclosure, under the heading Your Duty of Disclosure, on page 43. Words with special meanings Some of the words in your policy have special meanings wherever they appear. These words and their meanings are defined below. agreed value means the amount which we agree to insure your vehicle for as shown in your current schedule. declined driver means a driver, noted in the current schedule as a declined driver, who is not insured under this policy. excess means the amount shown in the current schedule which you must pay when you make a claim under your policy. market value means the cost to replace your vehicle with a vehicle of the same make, model, age and condition as your vehicle immediately prior to the loss or damage. NAB means National Australia Bank Limited ABN AFS Licence No National Financial Management means National Australia Financial Management Limited ABN AFS Licence No nominated driver means a driver, noted in the current schedule as a nominated driver, you have advised us will drive your vehicle. period of insurance means the period of time commencing on the effective date stated in the current schedule and ending on the expiry date stated in the current schedule. personal effects means personal items owned by you which are designed to be worn or carried, but not: cheques, money, credit cards or negotiable instruments, or firearms, or tools or items used in connection with a business or occupation, or personal music devices or portable Global Positioning Systems (GPS). 11 recoverable means to recoup the expenses we incurred in providing cover for any accidental loss or damage to your vehicle or in covering any of your legal liability costs after a claimable event. An event that would not be recoverable includes, but is not restricted to, an at-fault claim, a not at-fault claim where you are unable to provide us with the responsible party s name, address and vehicle registration number, any storm or naturally occurring event and a collision with an animal. Your No Claim Bonus may be affected and an excess may be required for any claimable event that is not recoverable by us, unless otherwise stated in this Policy Document. substitute vehicle means a vehicle similar to your vehicle which has been hired or borrowed because your vehicle is being repaired, serviced or is not drivable because of a mechanical breakdown. vehicle usage means the use of your vehicle, which you have told us about. This is shown on your current schedule. Vehicle usage may be either: business which means any vehicle which: is registered as a business vehicle, or is used for income earning purposes. private which means any type of use other than business use. we, our or us means Allianz Australia Insurance Limited ABN , AFS Licence No , of 2 Market Street, Sydney, NSW, you or your means the person(s) named in the current schedule as the insured. your vehicle means the registered vehicle shown on your current schedule including: its standard tools, modifications and accessories as supplied by the manufacturer, its fitted or non-standard extras, modifications and accessories which you have listed on your proposal or given us details of later and which we have accepted and included on the current schedule. 12 If you have comprehensive cover Cover for accidental loss or damage to your vehicle We will cover you for accidental loss (including theft) or damage to your vehicle. At our option we will: a. repair your vehicle; or b. pay you the reasonable cost of repairing your vehicle; or c. pay you the market value of your vehicle when the current schedule shows that your vehicle is insured for market value; or d. pay you the agreed value of your vehicle when the current schedule shows that your vehicle is insured for an agreed value. The current schedule will show if your vehicle is insured for market value or agreed value. Further we will adjust your claims payment in accordance with the GST provision shown under the heading Conditions of cover, GST Notice on page 34. Replacement of new vehicle after a total loss If your vehicle was purchased new by you and becomes a total loss within two years of the starting date of the original registration, we will replace your vehicle with a new vehicle of the same make, model and series. If a replacement vehicle is not currently available, we will pay you either the market value or agreed value of your vehicle, whichever is shown in the current schedule. If we replace your vehicle, this policy will continue to cover your new replacement vehicle until the end of the period of insurance. We will not require you to pay any additional premium for this cover. We will also pay for the on-road costs (including 12 months registration and compulsory third party insurance) of the new vehicle if you pay us any refund amount obtained from your registration and compulsory third party insurance. Cover for damage to other people s property (legal liability) We will cover your legal liability to pay compensation for loss or damage to someone else s property caused by a motor vehicle accident which is partly or fully your fault. 13 This cover will apply if your legal liability for loss or damage to someone else s property arises out of the use of: a. your vehicle; and/or b. a caravan or trailer towed by your vehicle. We will also cover the legal liability for loss or damage to someone else s property of: c. any person who is driving, using or in charge of your vehicle with your permission; d. a passenger travelling in your vehicle or who is getting into or out of your vehicle; e. your employer, principal or partner arising from your use of your vehicle. We will not cover legal liability: a. when the loss or damage occurs to your own property, your spouse s or de facto s property or to property which is in your possession, custody or control; or b. which is insurable under any statutory or compulsory insurance policy or any statutory or compulsory insurance or compensation scheme or fund covering such legal liability. No cover for legal liability after a total loss On the date we confirm that we will pay your claim for the total loss of your vehicle, all cover under the policy in respect of that vehicle will cease. Additional cover for supplementary bodily injury (legal liability) We will also cover you, or a currently licensed driver of your vehicle driving the vehicle with your consent, for legal liability for death or bodily injury caused by or arising out of the use of your vehicle, if your vehicle is registered for use on a public road when the liability is incurred, from one or more of the following events: driving or being in charge of your vehicle or a substitute vehicle, goods being carried by or falling from your vehicle or a substitute vehicle, loading or unloading your vehicle or a substitute vehicle. We will also cover the legal liability of a passenger travelling in or getting into or out of your vehicle with your permission, or the permission of a currently licensed driver driving or in charge of your vehicle with your consent. 14 We will not pay: 1. if the event or series of related events that gives rise to the legal liability or any part of it is covered or indemnified in any way by any: statutory or compulsory insurance policy or any statutory or compulsory insurance, or compensation scheme or fund, even if the amount recoverable is nil. 2. any amount of a claim over that recoverable under any: statutory or compulsory insurance policy or any statutory or compulsory insurance, or compensation scheme or fund. 3. if the legal liability would have been covered or indemnified in any way if you had not failed to: insure your vehicle, register your vehicle, or comply with the requirements of any statutory or compulsory insurance policy or any statutory or compulsory insurance or compensation scheme or fund. 4. for legal liability to any: person driving or in charge of your vehicle, of your employees, or member of your family. 5. for legal liability in respect of any psychological or psychiatric injury (other than to the extent that it is directly caused by or arises from serious physical bodily injury of the person who suffers the psychological or psychiatric injury). 6. unless you or the person claiming under this section have notified us of a claim under this section within 6 months of you or that person first becoming aware of an intention to make a claim against you or that person. 7. for legal liability caused by or arising from an intentional act by you or any other person. 8. any amount of exemplary, punitive or aggravated damages. Maximum amount payable The maximum amount we will pay in total for all claims under this policy for damage to other people s property and/or supplementary bodily injury cover arising from a single event or series of related events is $20,000,000. 15 Other benefits we will pay Unless we have stated differently under one of the additional benefits listed below, any payment we may make under this section will be paid in addition to any amount payable for the damage to your vehicle or any amount payable under legal liability. 1. Substitute vehicle We will cover you for legal liability, up to the maximum policy limit of $20,000,000, for loss or damage to someone else s property while using a substitute vehicle. Only one substitute vehicle can be used at a time. We will not cover: your legal liability when we have already accepted a claim for the total loss of your vehicle, or your legal liability when the substitute vehicle is unregistered, or accidental loss or damage to the substitute vehicle. 2. Legal costs Provided we agree in writing, we will pay for all legal costs and expenses in defending any court proceedings which may arise from accidental loss, damage or liability covered by your policy. We will not pay for any legal costs and expenses relating to any criminal or traffic proceedings. 3. Rental car following theft If your vehicle is stolen we will arrange for you to be provided with a rental car: until your vehicle is recovered undamaged and you have been told of its location, or until your vehicle is recovered damaged and the damage is repaired, or until we settle your claim by paying the agreed value or market value or by replacing your vehicle, or for a maximum of 14 days, whichever happens first. The maximum daily rental charge we will pay is $75. We will not pay for: a rental car unless its hire has been arranged by us or pre-approved by us, the cost of fuel used during the rental period, or any accidental loss or damage to the rental car. If a rental or loan car is not available, we will pay you a daily travel allowance of $30. 17 we will reimburse you for the cost of: travel necessary to return you, your spouse, your de facto and/or dependent children to your home, and/or transportation to collect your vehicle when it has been repaired. The maximum we will pay in respect of any one accident giving rise to a claim is $ Emergency accommodation costs If your vehicle cannot be safely driven home after being: a. involved in an accident; or b. subject to malicious damage; or c. stolen, and you are more than 200 kilometres from your home, we will reimburse the cost of emergency accommodation for you, your spouse, your de facto or dependent children. The maximum we will pay in respect of any one accident giving rise to a claim is $ Re-keying and re-coding If the keys to your vehicle are stolen we will pay for the replacement of your vehicle s keys and the necessary re-coding of your vehicle s locks. The maximum amount we will pay is: the amount by which the cost to re-key and/or re-code your vehicle exceeds the basic excess payable for the claim, up to a maximum amount of $1,000 for any one claim. This benefit will only apply if: the theft of your keys has been reported to the police, and the keys have not been stolen by a family member, invitee or person who resides with you. Cover under this benefit does not entitle you to a claim for a rental vehicle or any other additional benefit. 18 Policy options Your current schedule will show which, if any, of the following policy options apply. Depending on the policy options selected, your premium may have been increased or reduced. 1. Rental or loan car following an accident When the current schedule shows that the rental or loan car following an accident option applies and we accept a claim for accidental damage, we will: a. provide you with a rental or loan car; or b. if a rental or loan car is not available, pay you a daily travel allowance of $30. The rental or loan car benefit will be provided from: the date repairs to your vehicle are authorised, or the date your vehicle is made available for repairs to be commenced, whichever is the later. The maximum daily rental charge we will pay is $75. We will provide the rental or loan car benefit: for a maximum period of 14 days, or until the repairs have been completed, or until we settle your claim by paying you the agreed value or market value, whichever happens first. We will not pay for: a rental car unless its hire has been arranged by us or pre-approved by us, the cost of fuel used while driving the loan car, or any accidental loss or damage to the rental or loan car. 2. Removal of basic excess for windscreen claims When the current schedule shows that the removal of basic excess for windscreen claims option applies, if the windscreen or window glass in your vehicle is accidentally broken or damaged, we will not apply an excess to your claim. This option only applies: a. to one claim in any one period of insurance; and b. if the broken windscreen or window glass is the only damage to your vehicle. Your no claim bonus entitlement is not affected if your claim is only for the cost of repairing or replacing the windscreen or window glass in your vehicle if it is accidentally broken or damaged. 19 3. Protected no claim bonus When the current schedule shows that the protected no claim bonus option applies, we will not reduce your current no claim bonus entitlement for the first claim in any one period of insurance which is your fault or where the responsible party cannot be identified. 4. Restricted drivers When the current schedule shows that the restricted driver option applies, we will not cover any accidental loss, damage or liability, which results in a claim, when the driver of your vehicle was a person under 30 years of age. We will not refuse to pay your claim if the driver of your vehicle: a. was found guilty of theft or illegal use of your vehicle; b. was a person paid by you to repair, service or test your vehicle; or c. was an attendant at a car park. 5. Named driver When the current schedule shows that the named driver option applies we will apply an Unnamed Driver Excess, if you make a claim for any incident when your vehicle was being driven by any driver not listed in your current schedule as a nominated driver. This excess, if payable, will replace any other excesses which would otherwise have been applicable. We will not impose the unnamed driver excess if the driver of your vehicle: a. was found guilty of theft or illegal use of your vehicle; or b. was a person paid by you to repair, service or test your vehicle; or c. was an attendant at a car park. 6. Tools of Trade When we accept a claim for accidental damage (including theft) under this policy, we will also cover accidental loss or damage to tools of trade, trade stock and materials. This option only applies: if the tools of trade, trade stock or materials are stolen via forcible and violent entry to your securely locked vehicle and/or tool box, permanently fixed to your vehicle; or if tools of trade, trade stock or materials are damaged as a result of a motor vehicle collision. 20 The maximum we will pay is the amount by which the cost to replace tools of trade, trade stock and materials exceeds the basic excess payable for the claim, up to a maximum amount of $1,500 for any one claim. Only one basic excess is applicable to any one claim event and only the basic excess is applicable to this Tools of Trade policy option. How you earn a no claim bonus For each claim free period of insurance, you will accumulate a discount off your next motor vehicle insurance premium up to a maximum amount. This maximum amount will vary according to the State or Territory in which your vehicle is garaged/kept. Any no claim bonus entitlement you hold with another insurance company is transferable. You may be required to provide documentary evidence of your current no claim bonus entitlement. Premiums are calculated prior to a no claim bonus discount being applied. The premium for a policy may increase if affected by a claim, regardless of whether the no claim bonus discount amount is altered. 21 If you have third party property damage cover only Cover for damage to other people s property (legal liability) We will cover your legal liability to pay compensation for loss or damage to someone else s property caused by a motor vehicle accident which is partly or fully your fault. This cover will apply if your legal liability for loss or damage to someone else s property arises out of the use of: a. your vehicle; and/or b. a caravan or trailer towed by your vehicle. We will also cover the legal liability for loss or damage to someone else s property of: c. any person who is driving, using or in charge of your vehicle with your permission; d. a passenger travelling in your vehicle or who is getting into or out of your vehicle; e. your employer, principal or partner arising out of your use of your vehicle. We will not cover legal liability: a. when the loss or damage occurs to your own property, your spouse s or de facto s property or to property which is in your possession, custody or control; or b. which is insurable under any statutory or compulsory insurance policy or any statutory or compulsory insurance or compensation scheme or fund covering such legal liability. Additional cover for supplementary bodily injury (legal liability) We will also cover you, or a currently licensed driver of your vehicle driving the vehicle with your consent, for legal liability for death or bodily injury caused by or arising out of the use of your vehicle, if your vehicle is registered for use on a public road when the liability is incurred, from one or more of the following events: driving or being in charge of your vehicle or a substitute vehicle, goods being carried by or falling from your vehicle or a substitute vehicle, loading or unloading your vehicle or a substitute vehicle. 22 We will also cover the legal liability of a passenger travelling in or getting into or out of your vehicle with your permission, or the permission of a currently licensed driver driving or in charge of your vehicle with your consent. We will not pay: 1. if the event or series of related events that gives rise to the legal liability or any part of it is covered or indemnified in any way by any: statutory or compulsory insurance policy or any statutory or compulsory insurance, or compensation scheme or fund, even if the amount recoverable is nil. 2. any amount of a claim over that recoverable under any: statutory or compulsory insurance policy or any statutory or compulsory insurance, or compensation scheme or fund. 3. if the legal liability would have been covered or indemnified in any way if you had not failed to: insure your vehicle, register your vehicle, or comply with the requirements of any statutory or compulsory insurance policy or any statutory or compulsory insurance or compensation scheme or fund. 4. for legal liability to any: person driving or in charge of your vehicle, of your employees, or member of your family. 5. for legal liability in respect of any psychological or psychiatric injury (other than to the extent that it is directly caused by or arises from serious physical bodily injury of the person who suffers the psychological or psychiatric injury). 6. unless you or the person claiming under this section have notified us of a claim under this section within 6 months of you or that person first becoming aware of an intention to make a claim against you or that person. 7. for legal liability caused by or arising from an intentional act by you or any other person. 8. any amount of exemplary, punitive or aggravated damages. 23 Maximum amount payable The maximum amount we will pay in total for all claims under this policy for damage to other people s property and/or supplementary bodily injury cover arising from a single event or series of related events is $20,000,000. Other benefits we will pay 1. Substitute vehicle We will cover you for legal liability up to the Maximum amount payable as specified in this policy for loss or damage to someone else s property while using a substitute vehicle. Only one substitute vehicle can be used at a time. We will not cover: your legal liability for any event which occurs after we have already accepted a claim for the total loss of your vehicle, or your legal liability when the substitute vehicle is unregistered, or accidental loss or damage to the substitute vehicle. 2. Legal costs Provided we agree in writing, we will pay for all legal costs and expenses in defending any court proceedings arising from liability covered by your policy. We will not pay for legal costs and expenses relating to any criminal or traffic proceedings. Uninsured motorists extension We will cover your vehicle for loss or damage arising from an accident caused by the driver of an uninsured vehicle up to a maximum amount of $4,000 including the cost of protection, removal and towing. You may only claim under this extension if you: a. did not contribute to the cause of the accident; b. can provide us with the name and address of the person responsible for the accident; and c. can provide the registration number of the other vehicle. 25 driving or being in charge of your vehicle or a substitute vehicle, goods being carried by or falling from your vehicle or a substitute vehicle, loading or unloading your vehicle or a substitute vehicle. We will also cover the legal liability of a passenger travelling in or getting into or out of your vehicle with your permission, or the permission of a currently licensed driver driving or in charge of your vehicle with your consent. We will not pay: 1. if the event or series of related events that gives rise to the legal liability or any part of it is covered or indemnified in any way by any: statutory or compulsory insurance policy or any statutory or compulsory insurance, or compensation scheme or fund, even if the amount recoverable is nil. 2. any amount of a claim over that recoverable under any: statutory or compulsory insurance policy or any statutory or compulsory insurance, or compensation scheme or fund. 3. if the legal liability would have been covered or indemnified in any way if you had not failed to: insure your vehicle, register your vehicle, or comply with the requirements of any statutory or compulsory insurance policy or any statutory or compulsory insurance or compensation scheme or fund. 4. for legal liability to any: person driving or in charge of your vehicle, of your employees, or member of your family. 5. for legal liability in respect of any psychological or psychiatric injury (other than to the extent that it is directly caused by or arises from serious physical bodily injury of the person who suffers the psychological or psychiatric injury). 6. unless you or the person claiming under this section have notified us of a claim under this section within 6 months of you or that person first becoming aware of an intention to make a claim against you or that person. 26 7. for legal liability caused by or arising from an intentional act by you or any other person. 8. any amount of exemplary, punitive or aggravated damages. Maximum amount payable The maximum amount we will pay in total for all claims under this policy for damage to other people s property and/or supplementary bodily injury cover arising from a single event or series of related events is $20,000,000. Cover for loss or damage caused by fire or theft We will also cover your vehicle for loss or damage caused by fire or theft. At our option we will: a. repair your vehicle; b. pay you the reasonable cost of repairing your vehicle; or c. pay you the market value of your vehicle up to the maximum amount of $5,000. Further we will adjust your claims payment in accordance with the GST provision noted under Conditions of cover, GST Notice on page 34. Other benefits we will pay 1. Substitute vehicle We will cover you for legal liability up to the Maximum amount payable as specified in this policy for loss or damage to someone else s property while using a substitute vehicle. Only one substitute vehicle can be used at a time. We will not cover: your legal liability for any event which occurs after we have already accepted a claim for the total loss of your vehicle, or your legal liability when the substitute vehicle is unregistered, or accidental loss or damage to the substitute vehicle. 27 2. Legal costs Provided we agree in writing, we will pay for all legal costs and expenses in defending any court proceedings arising from liability covered by your policy. We will not pay for legal costs and expenses relating to any criminal or traffic proceedings. 3. Towing Following fire or theft of your vehicle, we will pay the reasonable cost of protection, removal and towing of your vehicle to the nearest repairer, place of safety or any other place which we agree to. Uninsured motorists extension We will cover your vehicle for loss or damage arising from an accident caused by the driver of an uninsured vehicle up to a maximum amount of $4,000 including the cost of protection, removal and towing. You may only claim under this extension if you: a. did not contribute to the cause of the accident; b. can provide us with the name and address of the person responsible for the accident; and c. can provide the registration number of the other vehicle. 28 When we will not pay your claim We will not pay your claim if, at the time of any accidental loss, damage or liability which results in a claim, your vehicle, or a substitute vehicle (or any trailer or caravan attached to the vehicle), was: 1. Unlicensed driver being driven by any person, including you, who was not licensed to drive your vehicle. We will not refuse your claim if you can prove that you did not know the driver was unlicensed. 2. Declined driver being driven by a person nominated in the current schedule as a declined driver. 3. Restricted driver being driven by a person under 30 years of age and you have selected the restricted driver option. We will not refuse your claim if the driver of your vehicle: a. was found guilty of theft or illegal use of your vehicle; b. was a person paid by you to repair, service or test your vehicle; or c. was an attendant at a car park. 4. Driver under the influence being driven by you, or any other person: a. under the influence of any drug or intoxicating alcohol; or b. who, as a result of the accident, is convicted of driving under the influence of intoxicating liquor; or c. who had a percentage of alcohol in their breath or blood in excess of the percentage permitted by law in the State or Territory where the accident occurred; or d. who refused to submit to any test to determine the level of alcohol or drugs in the blood when reasonably requested by the police. We will not refuse your claim if you can satisfy us you had no reason to suspect that the driver was affected by alcohol or any drug. 29 5. Overloaded vehicle being used to: a. carry a number of passengers; or b. carry or tow a load, greater than that for which your vehicle was constructed. We will not refuse your claim if you can prove that the accidental loss, damage or liability was not caused or contributed to by its greater load or number of passengers. 6. Unsafe vehicle being used in an unsafe or unroadworthy condition. We will not refuse your claim if you can prove that the accidental loss, damage or liability was not caused or contributed to by the unsafe or unroadworthy condition of your vehicle. 7. Carrying passengers for hire, fare or reward being used to carry passengers for hire, fare or reward except under a private pooling arrangement. If your fulltime employer pays you a travelling allowance, we will not consider such an allowance as hire, fare or reward. 8. Motor sport being used for any motor sport or time trial or was being tested in preparation for any motor sport or time trial. 9. Motor trade being used in connection with the motor trade for experiments, tests, trials or demonstration purposes. We will not pay any claim for accidental loss, damage or liability caused by or arising out of: 10. Deliberate, intentional, malicious or criminal act a deliberate, intentional, malicious or criminal act (including theft, conversion or misappropriation) caused by or involving: a. you, or any other person named in the current schedule; or b. any person who is acting with your express or implied consent. 11. War any war, hostilities or warlike operations (whether war be declared or not), rebellion, civil war, revolution, insurrection, military or usurped power, invasion, acts of foreign enemy or popular or military rising. 30 12. Nuclear ionising radiation or contamination by radioactivity from: a. any nuclear fuel or from any nuclear waste; b. the combustion of nuclear fuel (including any self-sustained process of nuclear fission); or c. nuclear weapons material. This policy does not cover loss, damage, liability, injury, death or damage arising directly out of or in any way connected with: 13. Terrorism Exclusion a. any act of terrorism arising directly or indirectly out of or in any way connected with biological, chemical, radioactive, or nuclear pollution or contamination or explosion; or b. any action in controlling, preventing, suppressing, retaliating against, or responding to any act referred to in (a) above. An act of terrorism includes, but is not limited to, any act, preparation in respect of action or threat of action, designed to: a. influence a government or any political division within it for any purpose, and/or b. influence or intimidate the public or any section of the public with the intention of advancing a political, religious, ideological or similar purpose. 14. Absolute Asbestos Exclusion the existence, at any time, of asbestos. Nor will we pay for: 15. Loss of use any loss of use of your vehicle, except for those circumstances detailed in: Other benefits we will pay, Rental car following theft on page 15, Other benefits we will pay, Transportation costs on page 16, Other benefits we will pay, Emergency accommodation costs on page 17, or Policy options, Rental or loan car following an accident on page 18. 31 16. Depreciation depreciation, wear and tear to your vehicle. 17. Breakdown mechanical or electrical breakdowns, failures or breakages to your vehicle. 18. Tyres damage to the tyres caused by application of the brakes or by road punctures, cuts or bursts. 19. Lawful seizure accidental loss or damage as a result of the lawful seizure of your vehicle. 20. Safeguarding your vehicle accidental loss or damage to your vehicle at any time, including after an accident, theft or breakdown, unless you have taken reasonable steps to protect or safeguard it. Reasonable steps include ensuring that any security or tracking device in your vehicle is fully maintained and activated at the time of loss or damage. 21. Renting a vehicle a. any costs associated with the loan of a vehicle; or b. the cost of renting a vehicle, except for those circumstances detailed in: Other benefits we will pay, Rental car following theft on page 15, Other benefits we will pay, Transportation costs on page 16, or Policy options, Rental or loan car following an accident on page Failure of computer or similar equipment loss or damage to any machinery, equipment, part, accessory or other property which: a. is a computer or which contains or comprises any computer technology (including computer chip or control logic); b. fails to perform or function in the precise manner for which it was designed for any reason arising from the performance or functionality of such computer technology (including computer chip or control logic); or c. arises directly or indirectly from the importation of any software virus whether the importation was malicious, negligent or accidental. 32 Conditions of cover 1. Changes to your insurance details what you must tell us You must tell us immediately if during the period of insurance: a. the drivers of your vehicle change; or b. the place where your vehicle is regularly garaged/ kept changes; or c. your vehicle is modified in a manner that affects its value or performance in any way; or d. the usage of your vehicle changes from private to business; or e. any security or tracking devices on your vehicle are modified or no longer operational; or f. any finance on your vehicle changes. When we receive this information, we may: alter the terms and conditions of your policy, or charge you additional premium, or decide not to offer to renew your policy. If you do not provide the information immediately we may not pay a claim under the policy. Before we agree to renew your policy you must tell us if, during the current period of insurance, you or any person who is a driver of your vehicle has: been convicted of or had any fines or penalties imposed for a serious criminal and/or driving offence and/or any crime involving drugs, dishonesty, arson, theft (including stealing a motor vehicle), illegal use of a motor vehicle, fraud or violence against any person or property, or been convicted of or had any fines or penalties imposed for any driving related alcohol and/or drug offence, or had a driver s licence cancelled or suspended or been disqualified from holding a driver s licence for any period, or been responsible for causing any motor vehicle accident, or had any motor vehicle damaged or stolen. For your assistance we have provided a full explanation of your duty of disclosure and the consequences of nondisclosure, under the heading Your Duty of Disclosure on page 43. Motorcycle Insurance. Product Disclosure Statement and Policy Document.